Bangkok – Members of hill tribes from various parts of Thailand have visited the royal funeral exhibition of His Majesty the late King Bhumibol Adulyadej in Bangkok. Around 290 ethnic hill tribe people, including Karen, Mhong and Akha, arrived at Sanam Luang Friday on buses provided by the Ministry of Social Development and Human Security and the Ministry of Culture. 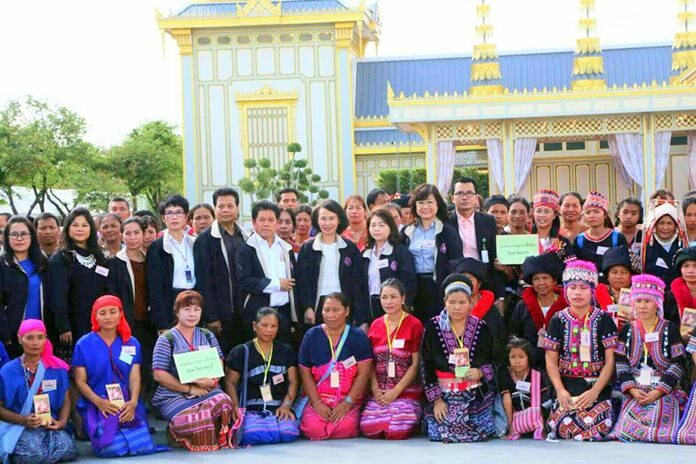 They had the opportunity to express their gratitude to His Majesty the late King for his efforts to improve the lives of hill tribe people and learn about the royal funeral ceremony. They said they were proud to be Thai and would apply His Majesty the late King’s teachings to their lives. Volunteers and staff were on hand throughout the exhibition to provide background information and to answer visitors’ questions about the royal cremation ceremony. The exhibition is open daily from 7:00 a.m. to 10:00 p.m. until the end of this month.